If you are able to dedicate 3-6 weeks to your health, then this is the program for you. Weight Loss, Finally Made Simple & Easy! With our weight loss program, you are able to turn your body into a fat burning machine! Our weight loss program can help you shed off non-essential fat – the fat we all want to get rid of. The length of the program depends on the amount of weight you need to lose. The total length of the program can be 10 weeks long with an active weight loss period of 3 weeks or 13 weeks long with an active weight loss period of 6 weeks. We recommend the 3-week active weight loss period for those who wish to lose between 15-20 pounds. And, the 6-week active weight loss period for those who wish to lose more than 20 pounds. Maintenance is considered the most important part of the program and therefore 6 weeks of the total program length are dedicated to helping you maintain your new weight. The total length of each program is considered a cycle, so if more weight is indicated to be lost a new cycle can be started right after maintenance has been completed. Aside from your complete commitment, dedication, and adherence, the program involves specific dietary changes that are compatible with a fat burning metabolism, natural supplementation and detoxification, and monitoring by the doctor. There are no prepackaged foods, bars, or shakes to buy – you are responsible for your food as this is part of the establishment or proper dietary habits. You are monitored weekly during the active weight loss period of the program. All supplements are included in the program. We use no stimulants on this program. We simply help your body engage into it’s own fat burning mechanisms to help you get rid of fat. I lost 37lbs in my 6 weeks of the active weight loss phase of my program. I am satisfied with the rate at which I lost the weight and would consider starting a new cycle. I would recommend this program to all of my friends and family. I gained a lot of confidence on how to properly manage my weight. I would not change anything about the program. I lost 18lbs in my 3 weeks of the active weight loss phase. I am satisfied with the rate at which I lost the weight and wouldn’t change a thing. I would even consider starting another cycle if needed. The doctor was so patient with me and all my questions. I would recommend this program to all my friends and family. I lost 30lbs in my 6 weeks of the active weight loss phase. I am very satisfied at the rate of which I lost it and would consider starting another cycle. The confidence I gain in how to properly manage my weight is amazing. There is nothing I would change about the program. I lost 27lbs in my 6 weeks of the active weight loss phase. I am satisfied with the rate at which I lost the weight and would consider starting another cycle. I gained confidence in how to properly manage my weight and would recommend this program to my family and friends. I would only change one thing about this program but in a good way. 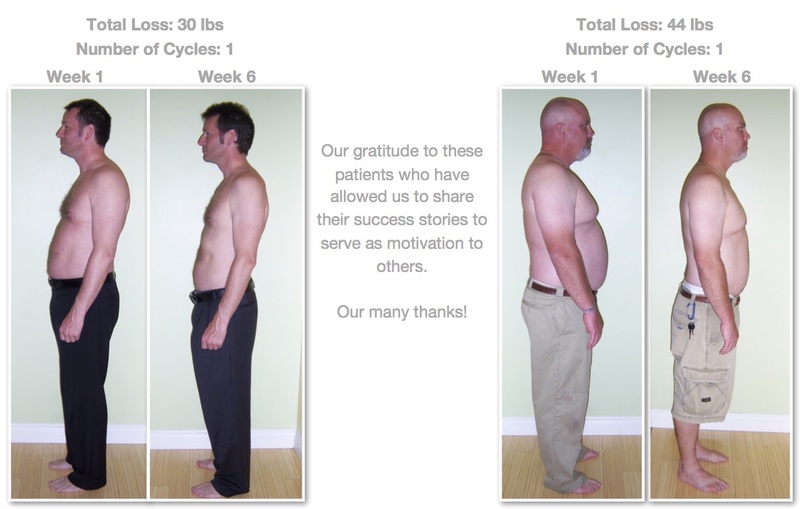 I would like more holistic doctors in my area, Kern County, so more people have a chance to lose weight like I did. My comment to anyone starting this program is DO NOT CHEAT while on it. I regret cheating; I could have lost over 35lbs if I had not cheated. I lost 23lbs in my 3 weeks of the active weight loss phase. I am satisfied with the rate at which I lost it and would consider starting another cycle. I gained confidence in how to properly manage my weight. Using the food scale is awesome; learning portion control is key! If I could change anything about the program I would make it so I could carry Dr. Rivas with me every day. I would put him on a keychain! If your thinking about starting or started the program my comments to you would be, “Keep strong on the goal; eye on the prize.” It is doable, but a relearning experience!